And All Their Glory Past is the story of the last major battles of the War of 1812 in the northern theatre, which were fought in the summer and autumn of 1814 and had a decisive effect on how the war ended. The first of these actions is the 53-day siege of Fort Erie, which incurred more casualties than the better known battle of New Orleans in some of the most vicious fighting of the war. The Americans besieged in the fort on the Canadian side of the Niagara River succeeded in driving off the British attacks but decided to withdraw across the border before the onset of winter, thus marking the end of hostilities on Canadian soil. The second major action is the naval and land battle of Plattsburgh, New York. An outgunned American naval squadron on Lake Champlain succeeded through outstanding seamanship in defeating their Royal Navy opponents, causing the British commander in chief, General Sir George Prevost, to withdraw, a reverse he was unable to live down and an American victory that had a direct bearing on the final outcome of the war. Written by Donald E. Graves, known as the “master of the battlefield narrative” and acknowledged internationally as an authority on the War of 1812, And All Their Glory Past is a fascinating blend of scholarly research, engaging narrative and insight into the minds of men under the stress of combat. It complements two previous books by Donald E. Graves, Field of Glory: The Battle of Crysler’s Farm, 1813 and Where Right and Glory Lead! The Battle of Lundy’s Lane, 1814, widely read classics that have remained in print for more than a decade due to popular demand. The long-awaited And All Their Glory Past completes Donald E. Graves’s trilogy on the War of 1812 in the northern theatre. The previous volumes are Field of Glory: The Battle of Crysler’s Farm, 1813, and Where Right and Glory Lead! The Battle of Lundy’s Lane, 1814. "Graves excels in using apt quotations from original sources. He has made extensive use of American, British, and Canadian public archives and historical society libraries in his search for documents. For example, in reconstructing events of the 1813-1814 campaigns, he relies on the letters, journals and autobiographies of not only the leading personalities, but also of the mid-level officers and ordinary foot soldiers. Several appealing characteristics of Graves’s style are his mordant sense of humor, his appreciation of soldiers’ anecdotes, and the inclusion of one or two stanzas of soldiers’ songs, ‘the poetry of the lower ranks,’ that introduce most chapters. Each book contains valuable appendices, clear maps, good illustrations, and explanatory citations which enhance the text. Taken together, these volumes make an essential and important contribution to the history of the war, written by a master of the genre. This trilogy is highly recommended reading for U.S. students and scholars who have not taken the time or made the effort to comprehend the War of 1812 in the Canada-U.S. borderlands." Graves has produced yet another fine study of 1812. This war and those who fought in it were once almost forgotten. That observation is no longer true and much of the credit goes to Donald Graves." "It’s sometimes easy to forget that the War of 1812 was still being hotly contested in 1814 and that the war’s bicentennial is continuing throughout this year. Fortunately, Canada’s leading War of 1812 historian, Donald E. Graves, has published a new volume exploring the pivotal campaigns that preceded the end of the war. And All Their Glory Past is a must for anyone interested in Canadian military history and a fitting final work in Graves’ trilogy exploring the War of 1812." "Not unexpectedly there are numerous accounts by both senior and junior British officers, but what makes And All Their Glory Past unique is how [Graves] weaves into the narrative the voices of those who rarely are heard in most histories. These include from the Canadian side aborigine leaders and women. Nor are the Americans overlooked. There are many quotes not only from diaries and letters of American officers, but of enlisted soldiers, militia, and even of a drummer boy! Once again Don Graves has written a superb book on the War of 1812. His engaging writing style will hold the interest of the casual reader, while the wealth of detail will satisfy the serious scholar. 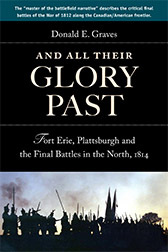 And All Their Glory Past is not just for those interested in the War of 1812; I highly recommend it for anyone interested in American and Canadian military history or the Napoleonic Wars."